The Philippine Congress has extended martial law in Mindanao for another five months, or until December 31, to authorize government forces to enforce continued offensives against the Maute terror group in Marawi City. lawmakers voted in favor of the martial law extension and suspension of the privilege of the writ of habeas corpus in the south. Senate President Aquilino Pimentel III said 16 senators voted in affirmative, while only four rejected the proposed five-month extension. Meanwhile, It certainly looked like LPGMA party-list Rep. Arnel Ty forgot he was inside the session hall of Batasang Pambansa to listen to deliberations on the extension of martial law. 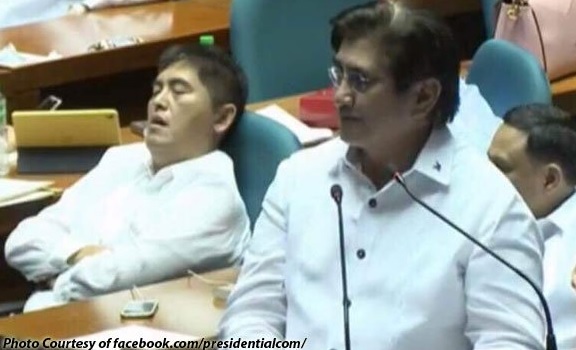 The state-run Radio TV Malacanang caught Ty sleeping comfortably in his chair as Senator Gregorio Honasan defended his motion to start voting on President Rodrigo Duterte’s request to prolong the validity of Proclamation No. 216. Ty certainly looked like he was in deep sleep, with his arms crossed over his chest and mouth slightly open. While lawmakers were expected to actively participate in the deliberations, Ty cant be blamed for trying to catch a few winks since they were required to be at Batasan by 9 a.m. for the special joint session. Ty woke up when it was time for the voting since he was one of the 261 lawmakers who voted in favor of extending martial law in Mindanao for five more months.